The general arrangement of the Music Concourse is based upon Michael O'Shaughnessy's design of the Grand Court for the California Midwinter Exposition of 1894. Remnants of the Midwinter Exposition can still be seen today; the dome-topped bollards line the upper promenade (some of these are original) and the concourse stairways, rails, tunnels and plantings have been rehabilitated over time since the Midwinter Fair. Wooden benches beneath a Bosque of pollarded sycamore and elm trees also provide a sheltering canopy in summer months as they have since the Temple of Music's construction. 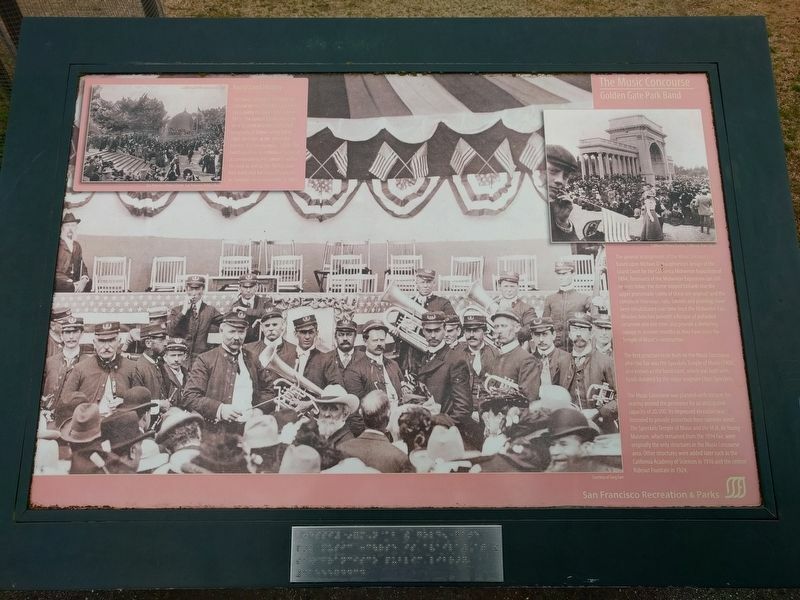 The first structure to be built on the Music Concourse after the fair was the Spreckels Temple of Music (1900), also known as the bandstand, which was built with funds donated by the sugar magnate Claus Spreckels. Music Concourse area. 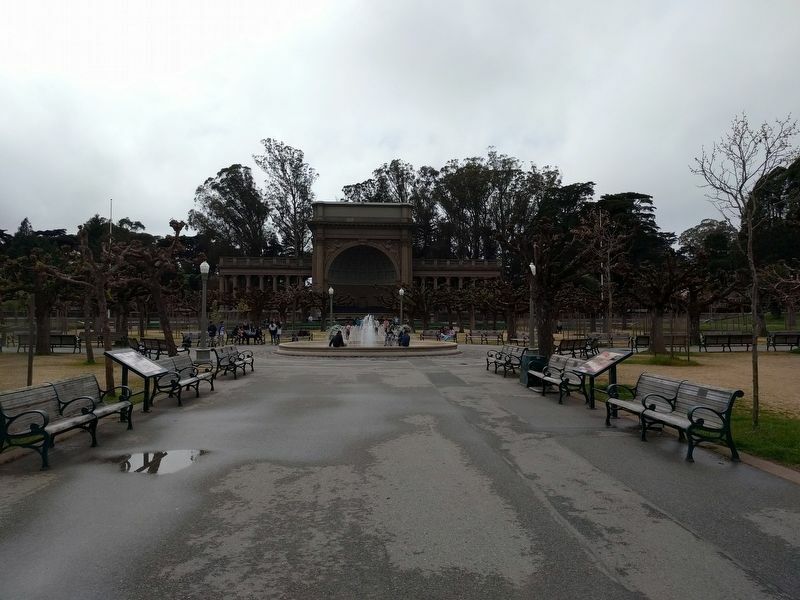 Other structures were added later such as the California Academy of Sciences in 1916 and the central Rideout Fountain in 1924. The Music Concourse has been the cultural center of Golden Gate Park since nearly the park's inception in 1871. 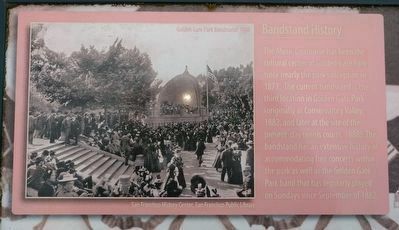 The current bandstand is the third location in Golden Gate Park (originally at Conservatory Valley, 1882, and later at the site of the present-day tennis courts, 1888). 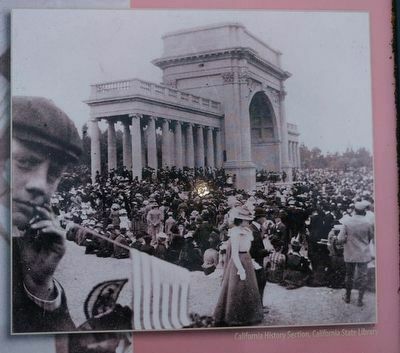 The bandstand has an extensive history of accomodating free concerts within the park as well as the Golden Gate Park band that has regularly played on Sundays since September of 1882. Location. 37° 46.227′ N, 122° 28.063′ W. Marker is in San Francisco, California, in San Francisco City and County. Marker can be reached from Music Concourse Drive north of Martin Luther King Jr. Drive, on the left when traveling north. Touch for map. Marker is in the Music Concourse between the south two fountains in Golden Gate Park. Marker is in this post office area: San Francisco CA 94118, United States of America. Touch for directions. Japanese Tea Garden (about 400 feet away); The de Young Museum in Golden Gate Park (about 400 feet away); The California Academy of Sciences (about 400 feet away); Japanese Tea Garden Gates (about 500 feet away); Migration of the Monastery Stones (approx. ¼ mile away); Planning Golden Gate Park (approx. ¼ mile away). Touch for a list and map of all markers in San Francisco. View looking south toward the bandstand. This marker is on the left. More. Search the internet for The Music Concourse. Credits. This page was last revised on April 14, 2019. This page originally submitted on April 14, 2019, by Joel Seewald of Madison Heights, Michigan. This page has been viewed 60 times since then. Photos: 1, 2, 3, 4. submitted on April 14, 2019, by Joel Seewald of Madison Heights, Michigan.